Alton Brown is my Spirit Animal, both in his sweets and his epic weight loss. So when I saw his Individual Peach Upside-Down Cake, I knew I had to tinker with it. Generally, I avoid peach in baked goods, as my mother is allergic to them. I have no idea what the original tastes like, but this is absolutely heavenly. Melt the butter. Divide 3/4 Tbsp butter between 2 ramekins, and roll them to coat the bottom evenly. Sprinkle butter with 1 Tbsp. of brown sugar for each ramekin (2 Tbsp). Lightly dust with cardamom. I said LIGHTLY. You don't want it to overpower the vanilla bean and plum. 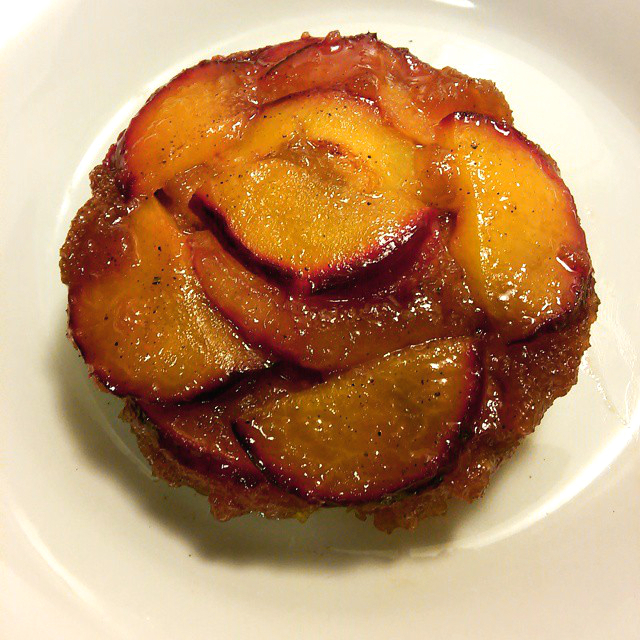 Cut plum into 12-14 pieces, and set on sugar evenly distributed on sugar and between ramekins. That's 6-7 pieces each. In a medium bowl, whisk together your flour, powder, and soda. Melt the remaining butter, and then whisk together with the remaining sugar. Then add coconut milk, and vanilla to the butter. If you add it before, you might have to microwave it a second to melt that sugar and butter again. And liquid to dry, and stir until just combined. Think muffins. Don't over do it! Pour evenly over fruit. Bask in the glory of those little black vanilla bean spots. Bake for 20-25 minutes, until lightly golden, surface springs back when touched AND toothpick comes out clean. Edges will be bubbly. Cool 5 minutes. Serve room temp or slightly warmer by running a knife around the edges first, and then popping them out by turning them upside down over your serving plate. Approx. 300 calories a cake. Makes 2.